The W -type SrCo2Fe16O27 (SCFO) hexagonal ferrite samples were prepared by the sol-gel method using metal nitrate as raw material, citric acid as complexing agent, and water as solvent. The effects of different sintering temperatures and holding times on the phase composition and morphology properties were explored in detail by using the X-ray diffractometer and field emission scanning electron microscope. 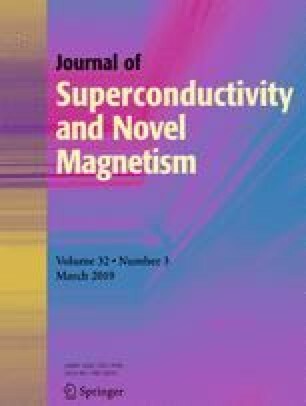 The X-ray diffraction, microstructure, and magnetic performance of most optimum sintering temperature and holding time of preparing single-phase SCFO hexagonal ferrite were investigated. The experimental results indicate that the best optimum sintering temperature and holding time of SCFO hexagonal ferrite are 1280 °C and 4 h, respectively. Field emission scanning electron microscopy results indicate that the size of the particles is about 5–10 μ m. The result of magnetic measurement shows that SCFO hexagonal ferrite exhibits the soft magnetic property and the Curie temperature (TC) is ∼ 850 K. Furthermore, by analyzing the Arrott plot, the phase transition near the TC is a secondary phase transition. This work was supported by the National Science Foundation of China (Grant No. 11464007), the National Science Foundation of Guangxi (Grant No. 2017GXNSFAA198373), the Guangxi Key Laboratory of Information Material Foundation (Grant Nos. 171020-Z and 171025-Z), and the Graduate Student Innovation Project of Guilin University of Electronic Technology (Grant No. 2017YJCXB01).